First off a round of puzzles on non-standard grids. The standout puzzle of this round was the Triangular Combo (4×45) consisting of a 9×9 Skyscraper pyramid surrounded by a classic Pyramid, a Kropki pyramid and a Japanese Sum pyramid, each sharing an edge with the central puzzle. Exactly one point per cell! My team mate Philipp had made one of these for us to practice, and I generally like these kinds of combination puzzles, so it was a natural starting place for me. I came through cleanly enough, except for a minor hiccup in the Japanese Sums treating the 11-6=5 leftover as a full 11 for a good while. It seemed to take quite long though – might have been a bit undervalued. But it was a lovely puzzle, it’s almost a bit sad this was hidden in a round of lots of other puzzles instead of standing on its own. After that one, I got through two Slitherlinks smoothly, on a hexagonal grid (30) and a Cairo pentagonal grid (70). Then a hex tetromino dissection puzzle Seven Tetrominoes (35) which I half-guessed smoothly, a tiny hex Slovak Sums (10), then wasted quite a bit of time proving the tight empty cell placement of a larger hex Slovak Sums (55) impossible, before flipping back to the first of two hex Skyscrapers (35) which I worked through (all clues given). Time was almost up at that point, and I didn’t get anything else out. I’ve since solved the rest of the puzzles. The Triangular Halfdominos (60) were really nice, as was the large Slovak Sums after I worked my way through it patiently. Six Winds with Hooks (25) was a rather cute and weird variant. And we had our first meeting with the infamous “worm rule” with Hexa Worms (45). Favorite puzzles: Triangular Combination, Triangular Halfdominos, Slovak Sums (55). The first really long round followed, with a whole lot of more or less original variants, as well as a few standard puzzles. I don’t really remember my strategy well for this round, but I believe I went through from the start, doing the puzzles I liked and skipping those I didn’t. I skipped the first three which were Easy as ABC variants (one with no diagonal touching, while the other two prescribed that a letter couldn’t be first – quite fiddly to solve). Then came two Corals with Vertex Hints (5, 20) a.k.a. corally Creek, and a First Seen Snake (20) which were a smooth start to the round. 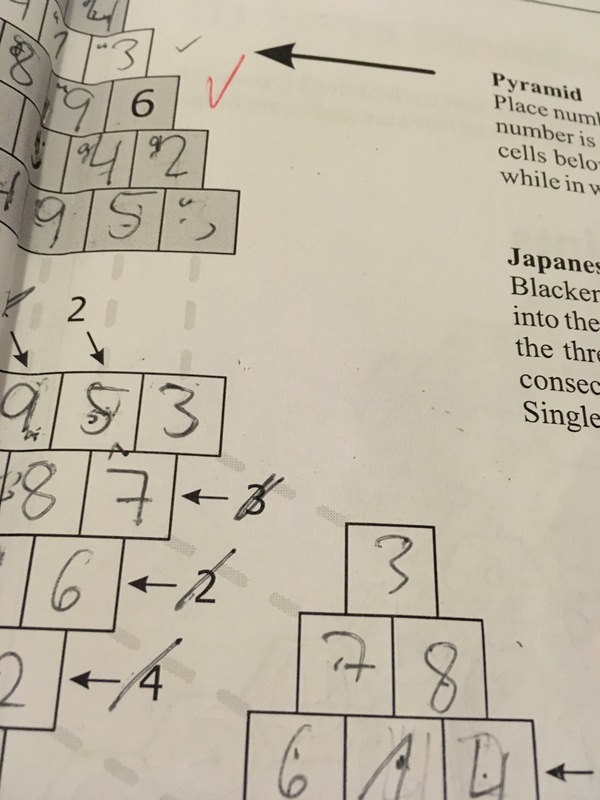 Then a reasonably highly valued Inner Coral (65), which I got through with quite a bit of casework, followed by a heavy Multiplicative Kakuro (100). I feel I (would have) made good points per time on this one, despite my factorization skills falling off massively after the “kleines 1-mal-1”. Unfortunately, with this round I started making some rather costly mistakes. Next came an “Odd/Even Snail”, the first puzzle where I made a mistake on the rules. It turns out the odd/even marking still allows for empty cells. 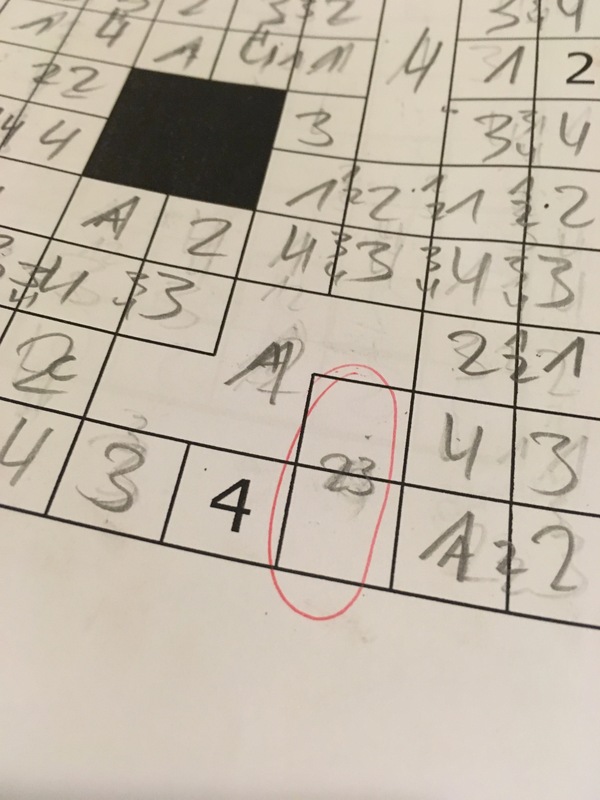 Thankfully the puzzle was obviously broken with the naïve interpretation (there’s no 2 evens in 123), so it didn’t cost me. I got the Numbered Snake (90) out quickly due to a combination of good preparation and luck – Berni had made a couple of these for us, so I was aware of the option of partitioning the odd/even row and column clues. This got me in, and in combination with a bit of solving experience and decent snake intuition I was done in no time. A Nurikabe Pento (65) came out easily with a bit of intuition, two Fillominos with fixed number sets (1-2-3 (45) and 3-4-5 (25)) were no problem either. I met the first case before under the name Trinudo. I really wish people started to typeset fillominos with dashed grid lines, though. 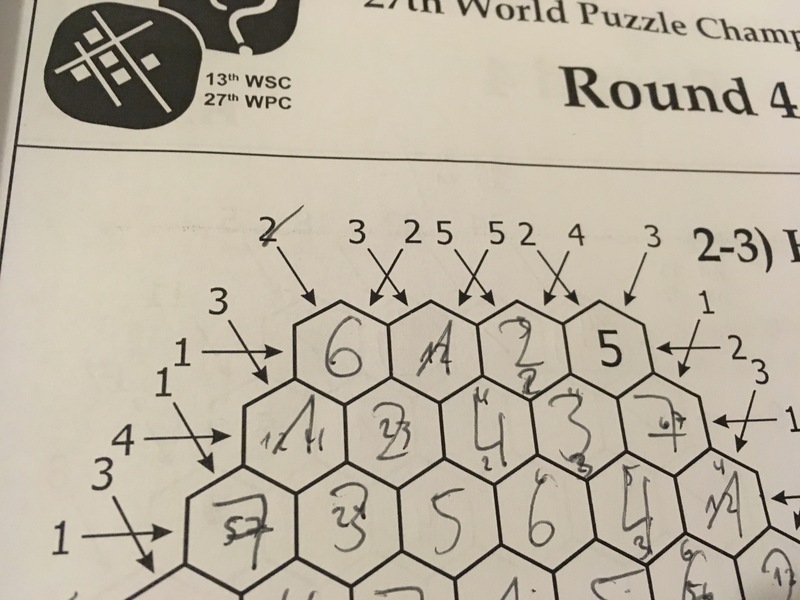 The Japanese Sums with given number set (50) were also a nice solve, something I did before on a 24h round. Then came a couple of Domino variants, of which I did the Condensed Dominos (45, 45). I think this is a very appealing take on the type. Then skipped ahead to Numbers Not Touching (50) a.k.a. Different Neighbors, which took me a bit of casework to break into, and failed to a second sloppy mistake. 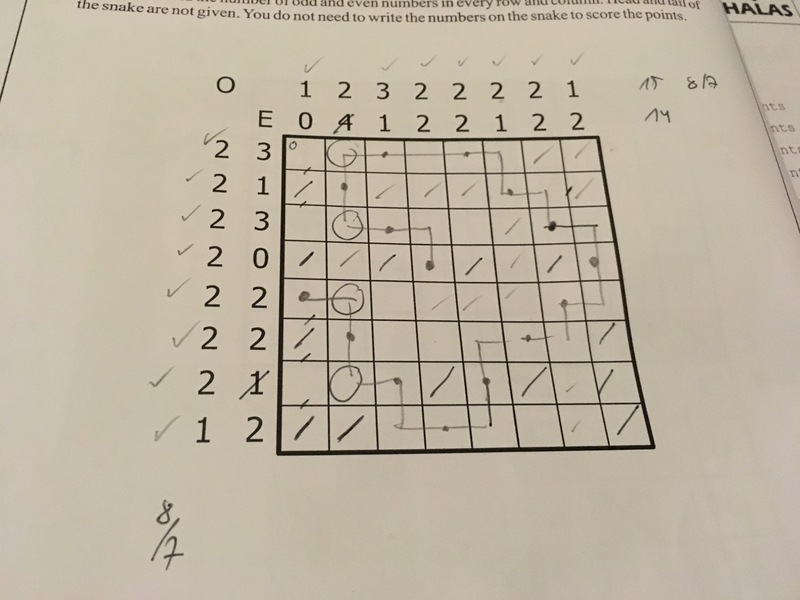 The final puzzle was Japanese Arrows (60), which was a fun solve, particularly with how the final unclued cell resolved – I was doubting uniqueness there for a while. There wasn’t anything particularly memorable among the the left-overs, though I should mention the Semitransparent Snake (20), which features a rather confusing ruleset but does allow for some interesting logic (and mistakes). Despite my costly mistakes, I kept up the trend of the previous rounds. This one could have been a lot better though! To end the afternoon, another long round of hybrid puzzles. With this one, I really don’t remember the order; I’ll go through the puzzles I attempted from start to finish. First were two loop puzzles, a Loop Around Pentominos (15) which I got instantly, though there turned out to be some rule confusion: The pentominos weren’t allowed to touch, which went unnoticed by me and others since the example puzzle only had a single pentomino. Thankfully, my solution was correct. Then a Loop Around Snake (40), where I also found the correct solution quickly with a good helping of intuition. The Battleship Pills (35) is a slightly confusing type – I remember one of my neighbors couldn’t get it out due to misunderstanding the rules. But I remember it being a reasonably clean solve on my part. Then came an expensive Battleships/Anglers hybrid with Ships and Fishermen (120) which I skipped, though solving it afterwords it was not really that hard. Then Snail on Snake (55) and Starwacky (50), both unremarkable solves. The Nurikabe Tapa was a lovely tricky puzzle that would have benefited from some preparation. I did find the logic while working on it. Unfortunately I ended up not resolving it correctly and didn’t notice, but it was more in the realm of proper mistake than sloppiness. LITS Tapa (35) had me confused for a bit but was clean enough. The two puzzles Galaxies and Tetrominoes (90) and Galaxies and Pentominoes (70) didn’t seem to live up to their score. The type has potential, though, as seen in the tetromino instance that featured in the individual playoffs, or in Berni’s practice puzzles: Tetromino-Galaxien, Pentomino-Galaxien. Next up was Gaps between Battleships (20, 95). I broke the little one with a convincing argument; I’m pretty sure I worked through the whole puzzle 4 times during the round. I needed outside help after the round to overcome this block. Given this, I barely did more than look at the big pointer, although it’s quite doable (if you don’t make mistakes). I had no practice puzzle here, but while trying to construct a 7×8 puzzle with the standard fleet I got a bit of practice. We’re pretty sure that’s not possible by the way. After these came two Snail / Easy as ABC variant hybrids with annoying rule differences. The first, Snail End View (55) gave the second letter per row/column and main diagonal with a standard ABCABCA… snail order. The second, Snail End View Untouchable (125) dropped the diagonal constraint, added a don’t-touch-diagonally constraint, and left it to you to figure out the permutation of ABCD followed throught the snail. Thankfully since Berni generated a couple of these and told us the top left corner is always empty for the Untouchable variant in sizes 7 and 8. (Not sure if this is easily deducable, or whether it was particularly helpful here.) Anyway both puzzles solved cleanly with similar techniques and ended up great value for time. The final puzzle of the round was Kakuro Domino (55), with the somewhat unthematic rule of “no repeats in rows/columns”. I forgot about that while solving despite being the one to ask for clarification on the forum two weeks before. My mistake, but I still feel it’s a good argument against too many strange rule variations. I did get it out and remember the rule in time to verify it, but I’m pretty sure it was more of a 100 point solve this way. In the end, this was another “average” round for me, with 84% of 10th place. It’s hard to summarize day 1 for me. 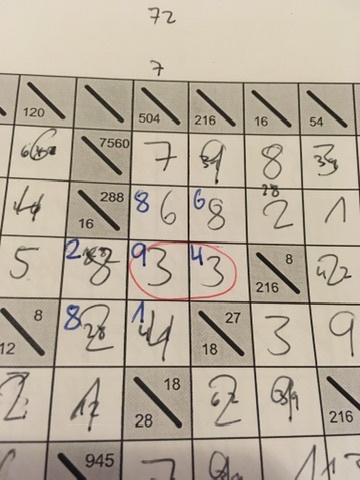 After the seemingly bad start, I felt I’d stabilized, but never felt like I was solving at speed. Reviewing now, some of my intuitive solves in round 5 make it seem like that wasn’t and accurate impression. At the time, I had no idea where I stood since I’d decided not to look at the score sheets. Though I checked my booklets for grading mistakes, hence knew how much I broke, but that seemed fine without comparison. Regarding the marking, this is another thing that the organizers did a wonderful job on. We got our booklets back well marked within a round or two, and I didn’t have a single marking complaint. Also thanks to our team captain Katharina who did a very diligent job tracking us down between both competition halls, and providing moral support (as in, listen to me complain) along the way. Read about the next rounds in part 3.